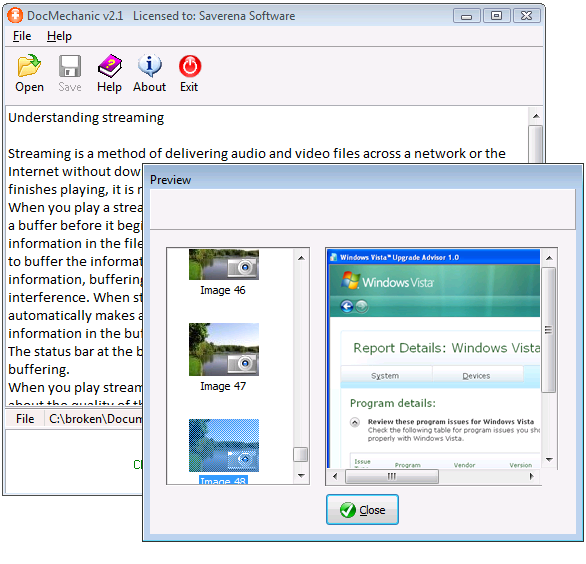 DocMechanic, is a efficient Microsoft Word (.doc) file recovery software. DocMechanic can recover various document problems including: 1. Data Corruption. 2. Document will not open and prompt you like "The document name or path is not valid.Try these suggestions...". 3.Unexpected System Shutdown and others. Features: Support to recover text in Word documents. Support to recover embedded images in Word documents. Supported *.doc file formats: Microsoft Word 95/97/2000/XP/2003. It can work under Windows 98/ ME/ NT/ 2000/ XP /Vista. Easy to use. No special user skills required. Supports Drag & Drop with Explorer/the Desktop etc.